The Hall of Hands Studio displays a list of all collected hands, marked with pocket cards and a short summary. You can rollover and click a hand you want to publish or read the details of published hands. All - watch all your collected hands. Won - watch the hands you won a pot. UnPublished - all collected hands that hasn't been published yet. 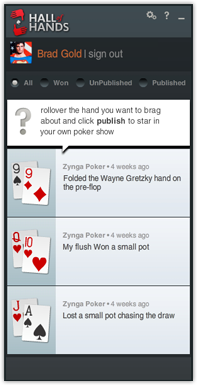 Published - all collected hands you chose to turn into a poker TV show.